It’s all well and good trying to be healthy but all those brilliant intentions fly out the window the day after the night before. I blame Guy Fawkes (and my friends); standing outside in the freezing cold on Bonfire Night yesterday waiting for the fireworks required serious amounts of warming liquidation in the form of too much red wine and whisky. There’ll be no rainbow-themed cooking for me tonight; the only colours I can think of are those that don’t hurt my eyes. 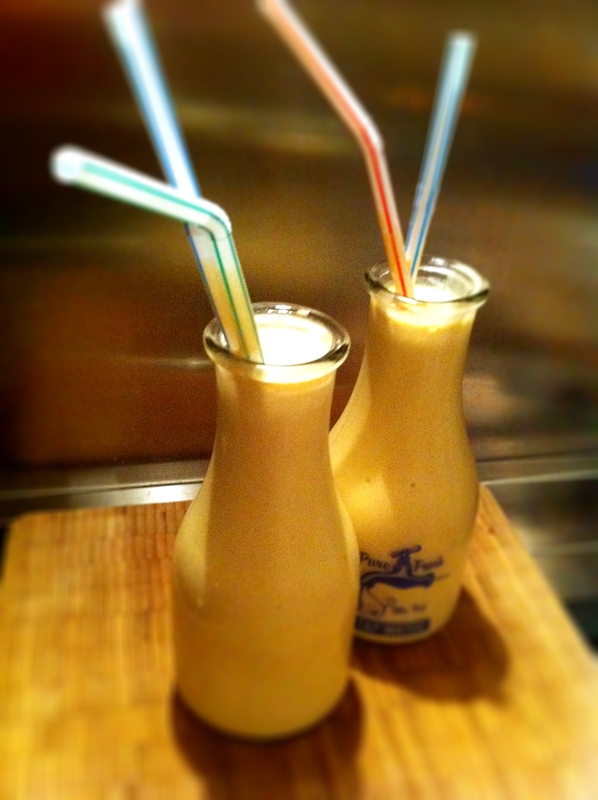 I can’t however believe how many recipes you can find online for peanut butter milkshakes! O.M.G. Anyway, I couldn’t face the bright glare of my computer screen for long so I choose the first recipe I found on youtube, and that was from Bettyskitchen. I haven’t however followed her recipe entirely as I put way less sugar than what she used as well as much more milk. I was after a milkshake that required very little effort to drink too. I don’t know how many calories I’ve just consumed, I don’t actually want to know and, at the moment, I really don’t care. The sugar’s keeping me together and the milk’s calming the jitters in my stomach. I’ll worry about the calories tomorrow when I can bear to open the curtains again. I just need someone to invent a noiseless blender because one minute’s blitzing just about broke me… I’m off back to bed again. Night night. Peanut butter milkshakes. Just don't think about the calories. They're meant to be used as glasses for water. Sod that! Ewwww, thank god I didn’t see your comment on the day of my hangover LOL sadly now I have to be extra healthy for a bit… Back to looking for rainbow coloured foods :)! Gah! And I was doing so well making only healthy smoothies. I’m going to have to make this for dessert tomorrow night! Ah, a bonfire hangover, I remember those when I used to hold bonfire parties, there would be 2 large pans of mulled wine on the go, all evening! Those bottle-glasses are sooooo cute! So, no eggs and tabasco sauce for you this morning? Oh my word…those just look out of this world. Gotta have the straws too, for good slurping! My favorite shake ever is one from Shake Shack in NYC…it’s a malted roasted marshmallow caramel shake…drool! I’m going to try making yours at home, I love peanut butter! PS I have a hard time resisting buying cute kitchen things too LOL. Your entries always make me laugh, bring a smile to my face. The little milk jugs and your yummy peanut butter shake would make anyone feel better. There are few things a peanut butter milkshake wouldn’t cure! Indeed. It really, really did help. Totally decadent and so bad for you but soooo good too. Hope you don’t get too drunk though, that would be bad. Bad Bad Bad, says the pot to the kettle. 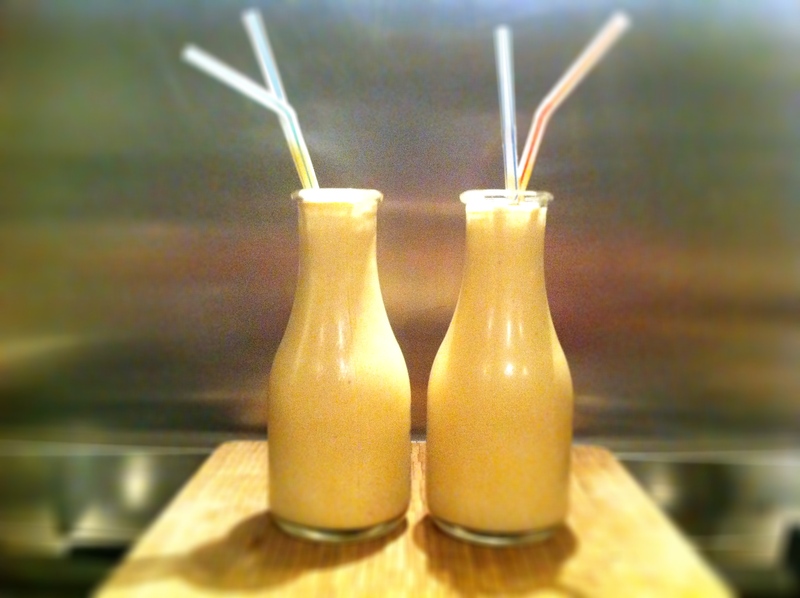 I remember having a peanut butter milkshake in one the health food store, it was so tasty. Now after seeing the pictures I am craving it. Will have to make it soon. 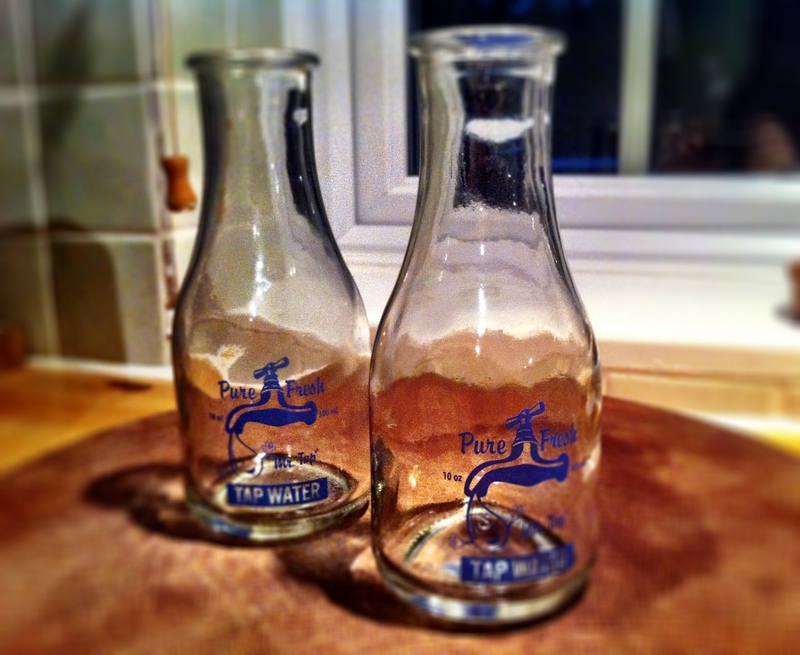 Love the bottles, very cute. I found them online at a gift shop in the UK. 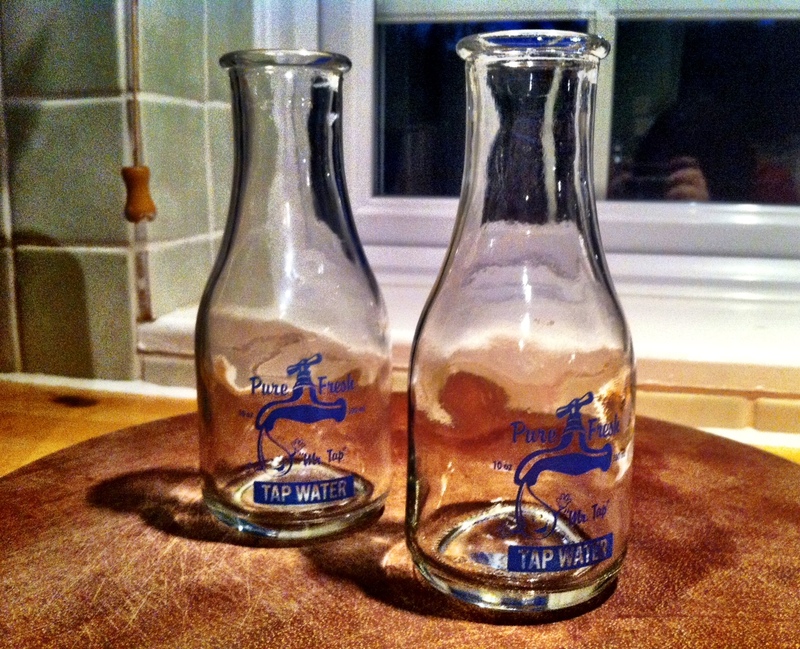 They’re like old style milk bottles.